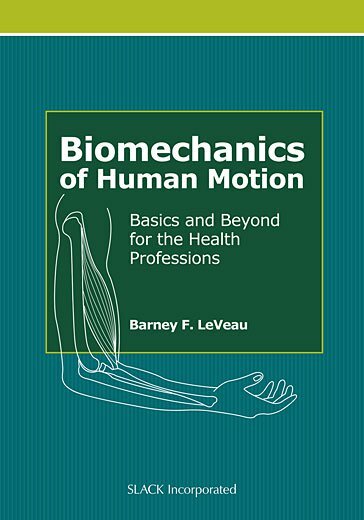 Biomechanics of Human Motion: Basics and Beyond for the Health Professions presents a straightforward approach to the basic principles, theories and applications of biomechanics and provides numerous techniques and examples for approaching biomechanical situations enhanced by healthcare professionals. Building on his previous work, Dr. Barney LeVeau uses clearly defined, concise terms and real-life applications rather than advanced mathematics to make teaching and learning biomechanics easier. Based upon the concept of force, the text illustrates how force is applied to the human body and how the body applies force to various objects. The emphasis is upon the pertinent factors that guide the reader to an understanding of biomechanics at a beginning level. Biomechanics of Human Motion: Basics and Beyond for the Health Professions provides students and clinicians of all allied health professions with a basic background and solid foundation on which to build a solid understanding of force and biomechanics. “This would be a good resource textbook for students entering occupational therapy or for occupational therapists who would like a better understanding of the biomechanical principles that inform their practice. "The author does an excellent job of outlining the basic principles of biomechanics. This well-written book fulfills its objectives. It is written at an appropriate level for its intended audience while still providing ample scientifically-based information for readers to grasp the basic principles of biomechanics. It is successful in accentuating the key points of biomechanics while filtering out more advanced theory that is unnecessary for this audience." Instructors: Visit our new website especially for you at efacultylounge.com! Through this website you will be able to access a variety of materials including, Biomechanics of Human Motion, Instructor's Manual . Inside you will find practice problems, quizzes, and examination questions. Dr. LeVeau earned his BS degree in Education with emphasis in mathematics, physics, and physical education at the University of Colorado in Boulder, CO; his Certificate in Physical Therapy from the Mayo Clinic in Rochester, MN; his MS in Physical Education from the University of Colorado; and his PhD in Biomechanics from Pennsylvania State University in University Park, PA. He has taught mathematics and science at Horace Mann Jr. High School in Colorado Springs, CO, and served as faculty in physical education and physical therapy departments at West Chester State College in West Chester, PA; University of North Carolina at Chapel Hill, NC; University of Texas Southwestern Medical Center at Dallas, TX; Georgia State University in Atlanta, GA; and Alabama State University in Montgomery, AL. He has published several research articles, book chapters, and 2 textbook editions related to biomechanics content. His texts have been translated in Spanish, French, and Italian. He has lectured nationally and internationally on topics covering biomechanics.